If your speakers are bi-wireable, but you are not using bi-wire speaker cables, quality speaker jumpers can make a dramatic sonic improvement. The jumpers provided with most speakers can actually limit full performance. The construction and level of performance of STAGE III speaker jumpers corresponds with the speaker cables of the same name. MEDUSA speaker jumpers employ 8 expanded cross-section, Cyro-treated, pure silver/palladium alloy AeroStrand Ultra™ ribbon conductors. 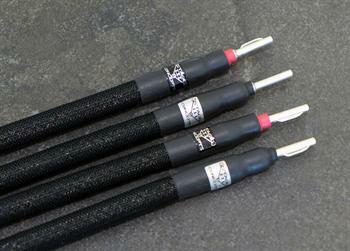 FEP Teflon air-tubes with dual layer ASPIS + plated copper braid shield. Terminated with Ultra-High-Current solid silver reference spades (or) silver-plated pure copper bananas.